The Associates World is the newsletter of the Paulist Associates. You can download a copy of this newsletter in PDF format (excellent for printing), or scroll down to read it in your Web browser. 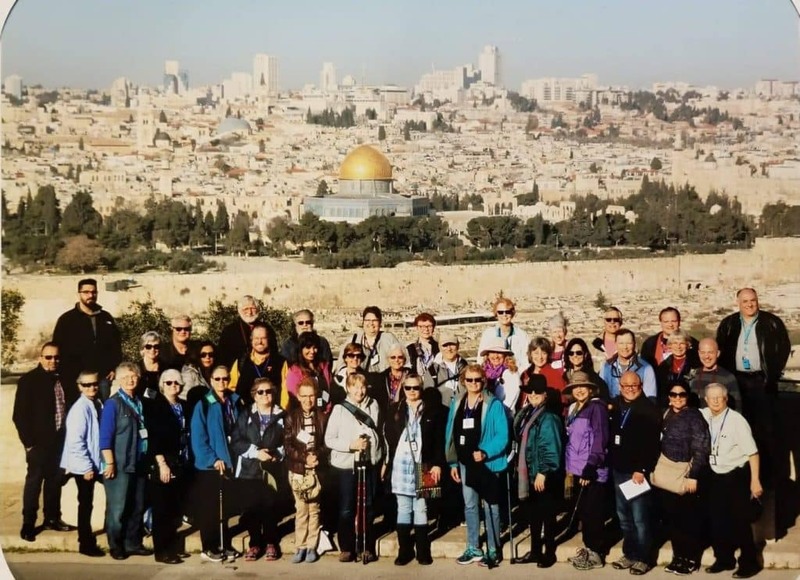 Our pilgrimage to the Holy Land was January 29 to February 9, 2018. Led by Fr. Rich Andre C.S.P, it was faith deepening, inspiring and eye opening. Most of the pilgrims were from American Paulist parishes, especially St. Austin’s, where Fr. Rich serves. There were four other Associates in the group, from Tampa and Los Angeles. It was a treat to see them again, and a delight to meet so many new friends. Some highlights to the trip will stay with me always. We were up very early every day to get to various holy sites before they became crowded, and some days kept moving very often, to see as many sites as possible. As Fr. Rich reminded us, this was not a pleasure trip, it was a pilgrimage. But due to the scheduling and planning of Fr. Rich and our Palestinian Christian guide, Johnny Asmar, quiet moments of peace and contemplation were inserted into the schedule at just the right times. 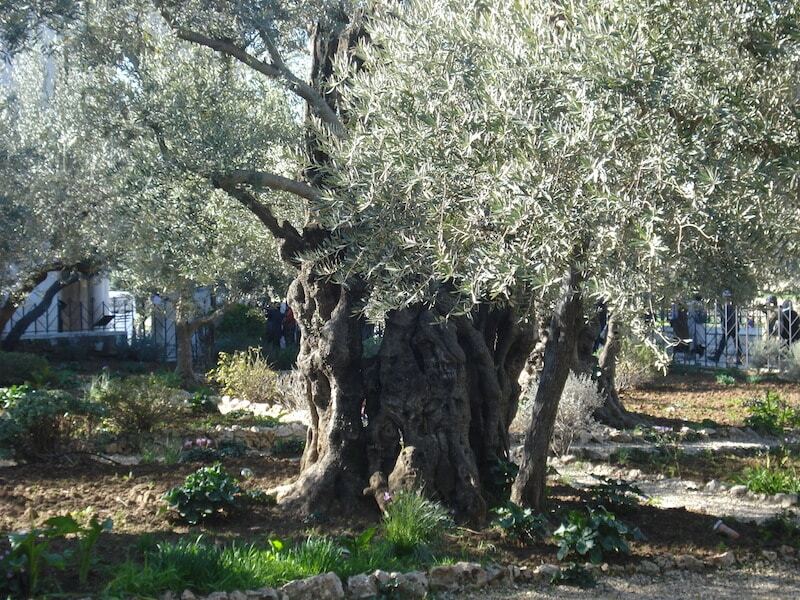 After visiting the Garden of Gethsemane, wondering if Christ had steadied himself against the ancient olive trees while he prayed, we crossed the street to a private section of the garden. There we had a penance service and an hour of peaceful contemplation. This was the time for me when my reasons for attending the pilgrimage, and all the people I was praying for, calmly came back to my mind. 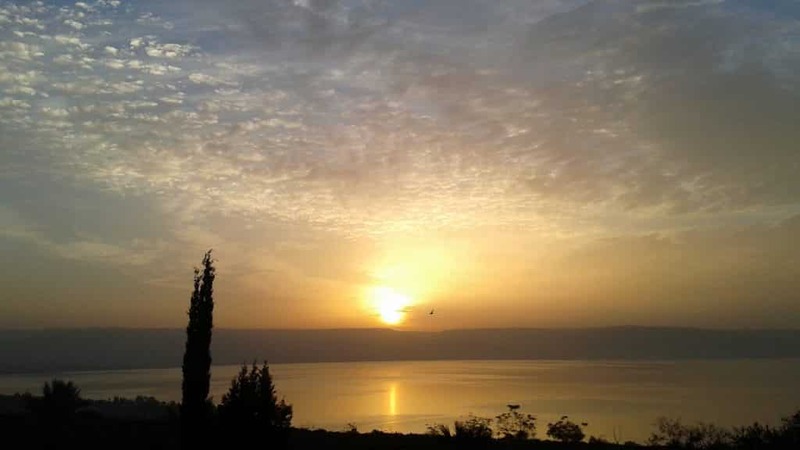 Another highlight was the sun rising over the Sea of Galilee very early in the morning. To think that Christ and his followers witnessed this beauty every day, and used the shore for preaching, healing and prayer inspired a great feeling of gratitude that I was able to be in that very place. In prayer, I was able to put myself into those events on the shore and on the sea. 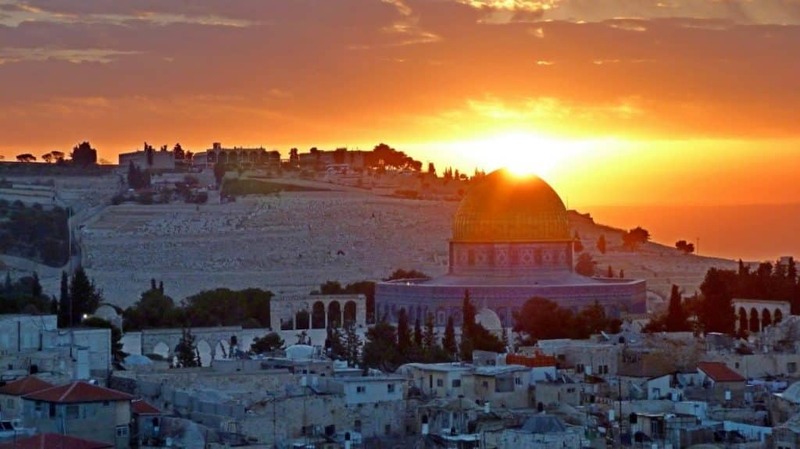 There is no ignoring the fact that the Holy Land, where I witnessed so many devout acts of faith and love of God from Muslims, Jews and Christians, is a place where that devotion and love rarely extends to fellow humans of different religious and political views. Our Palestinian guides told us of the hardships and injustices they experience every day under Israeli occupation. An Israeli Jew, who is involved in promoting peace, gave us insight into why Israel has been forced to protect its people. These were vital elements of the pilgrimage. One of the most positive experiences of the trip was the reverent, inspiring Mass we celebrated together at the top of Mount Tabor, site of Christ’s Transfiguration. It was a beautiful culminating experience. Fr. Rich reminded us that we would have to “come down from the mountain” after our time there, to practice in our daily lives what we had learned. I took that to mean that I should be trying harder to live peacefully with family and friends, and now that I’ve seen how conflict and intolerance can harm nations, be more understanding and open to others’ points of view. I encourage you to try to make this pilgrimage – it was an awesome experience. I don’t remember the first time that I met Fr. Bob Baer, C.S.P. Unfortunately, because he suffers with memory loss from dementia or Alzheimer’s, he too can’t remember when we were introduced. For a long while, I knew him from afar, seeing him at various liturgies and Paulist events. He was always nattily dressed, wearing a jacket and tie. He seemed to be a pensive man, who smiled most of the time. We would always exchange pleasantries, however, there was little conversation. In 2008, he moved into the Paulist residence at 5 Park Street in Boston, because it was determined that it would be best for him to no longer live alone. Our encounters were still by chance but more frequent. Sometimes I might find Fr. Bob in a store near my office, stocking up on chocolate and ice cream. Other times I’d see him on his daily constitutional to the various neighborhoods in the area. He is a mighty fine walker. He might come and sit next to me at the Sunday liturgy and chat a bit at the end of the Mass. Eventually our small talk moved to discussions about his health, his transition to retirement, and people — Paulists and others — whom we knew in common. At some point I gained the courage to ask him to lunch. I wanted to learn more about his preparation for his chapter in Hecker Studies, a collection of articles written in honor of the 125th year of the founding of the Paulists. Fr. Bob trained as a Jungian psychologist in Belgium and Switzerland, so he wrote a piece entitled “A Jungian Analysis of Isaac Thomas Hecker.” I had read this anthology as part of my research for my master’s thesis on Hecker. In time Fr. Bob asked me to take a walk with him, and we would do so every month or two. We’d visit his former residence or stroll through the Public Garden to see the beautiful flowers or stop into a CVS when his favorite candy or ice cream were on sale. He told wonderful tales of his studies in Europe, his life as a Paulist, and his mother and other family members. For his birthday or ordination anniversary, we’d go to a restaurant that serves salmon and ice cream. I came to know him as a brilliant mind as well as a warm and caring person. He was always nattily dressed, wearing a jacket and tie. In 2015, Fr. Bob moved to Marian Manor, a nursing facility run by the Carmelites, just a few blocks from where I live. I stop by a few times a month for a visit. Each time I visit him, he is still nattily dressed, often wearing a jacket and always wearing a tie. Many times, he has a dish of ice cream in his hands. We often walk the hallways. It is a long journey to the front door, and in good weather, we will walk to the benches in front of the building to have our chats. He has no short-term memory, and he says that he is often lonely because no one visits. I know that he has visitors; he just can’t recall that they have been there. He has long forgotten who I am. 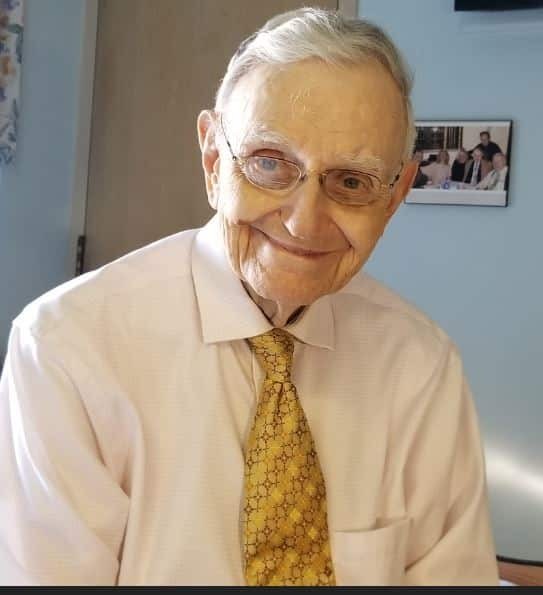 Yet, he can still entertain me with stories about his early years in Jackson Heights, New York, his days in the Navy during World War II, and his studies of Jungian psychology. A couple of months ago, I gave him a photocopy of his article from Hecker Studies. While he is always pleasant and happy to see me, he was exceptionally excited at the prospect of reading something to do with Jungian psychology. He picked out words and phrases that were meaningful to him. The next time I visited he had forgotten about it. He never forgets that he is a Paulist priest. He loves watching the Paulist videos from Facebook or the website. He can spend hours looking at the photos in the Paulist Chronicles on line. Sometimes he has a good memory of this one or that one but not too often. I will show him photos of various people and events at the Paulist Center. I sometimes bring him a copy of The Associates World to read. A former colleague told me that her mother-in-law had lived down the hall from Fr. Bob and how exceedingly kind he was to her. She also said that when she brought her four-year-old grandson to visit, Fr. Bob always made sure to give him a blessing. Moments, here and now, are precious. It doesn’t matter that he can’t remember my name or how he knows me or what we did during my last visit. However, Fr. Bob tells me that he feels “the warmth of friendship” from me when I am there. I also recognize that when I leave, within a minute or two, he probably won’t recall that I’d been there. Still, I take comfort knowing that in the moments we spend together he is not lonely, and neither am I. On a hot Saturday in July, most of the Roman Paulist Associates made a mini-Retreat to a little Chapel on the outskirts of Rome on Via Cassia – La Storta. This Chapel of the Vision has special meaning for Jesuits and friends. Since St Ignatius of Loyola is a Paulist Patron, it also has a connection with Fr. Hecker. Two of our Paulist Associates (who just celebrated their 25th wedding anniversary) were so kind to drive us out there and back as well as to take many photographs recording this unforgettable pilgrimage. The Chapel is very important because St Ignatius went there to pray before founding his company, or society of Jesus. While there, he had a vision of God the Father placing him in the company of Jesus carrying the Cross. There is also a sign on the wall in Latin “I Will be with you in Rome”. During the Middle Ages and after, the Via Cassia was one of the most important streets used by pilgrims to Rome. On the front of the Chapel there are 2 low windows with steps that pilgrims could kneel on to see the interior and pray when the Chapel was closed. Fr Tommaso Kane C.S.P. celebrated Mass and his guest, Prof Brian Taberski, who teaches at the University of Seattle, gave the homily. We ended our pilgrimage with a delicious lunch under the trees at a Roman Trattoria nearby. Thanks to Fr. Rich Andre, CSP for preparing this program. He is a member the Associate Pastor of St. Austin’s. Pope Francis released his latest apostolic exhortation, Gaudete et Exsultate, on March 19, 2018. Based on the Beatitudes, it is a treatise on how all people are called to grow in holiness. Like his previous Evangelium Gaudium (on evangelization) and Laudato Si’ (on the care of our common home, the earth), Francis writes in engaging prose. Each of these three documents are lengthy, but almost any paragraph in them can be examined on its own. Below are six paragraphs from Gaudete et Exsultate that might especially inspire those devoted to the charism of the Paulist Fathers. Quickly choose a paragraph to discuss, perhaps by rolling a die or by designating someone in the group in advance to choose a paragraph. Have someone in the group read the paragraph aloud. Take one minute for everyone to silently contemplate the paragraph. Discuss the paragraph for as long as there is energy to do so. Quickly choose another paragraph and repeat the process. There is no need to discuss all six paragraphs in one gathering. We can imagine some groups of Paulist Associates taking the whole evening to discuss three, two, or even just one of these paragraphs! 6. [When discussing saints, we need not] think only of those already beatified and canonized. The Holy Spirit bestows holiness in abundance among God’s holy and faithful people, for “it has pleased God to make men and women holy and to save them, not as individuals without any bond between them, but rather as a people who might acknowledge him in truth and serve him in holiness” (Lumen Gentium, 9). In salvation history, the Lord saved one people. We are never completely ourselves unless we belong to a people. That is why no one is saved alone, as an isolated individual. Rather, God draws us to himself, taking into account the complex fabric of interpersonal relationships present in a human community. God wanted to enter into the life and history of a people. When you hear the word “saint,” what’s the first image that comes to your mind? How can we promote a broader vision of what holiness encompasses? What do you make of Francis writing, “No one is saved alone, as an isolated individual”? 27. Could the Holy Spirit urge us to carry out a mission and then ask us to abandon it, or not fully engage in it, so as to preserve our inner peace? Yet there are times when we are tempted to relegate pastoral engagement or commitment in the world to second place, as if these were “distractions” along the path to growth in holiness and interior peace. We can forget that “life does not have a mission, but is a mission” (Xavier Zubiri, 1993). Do you agree with the quotation of Xavier Zubiri? Have you conquered the temptation to see “pastoral engagement” as a distraction to “holiness and interior peace”? 41. When somebody has an answer for every question, it is a sign that they are not on the right road. They may well be false prophets, who use religion for their own purposes, to promote their own psychological or intellectual theories. God infinitely transcends us; he is full of surprises. We are not the ones to determine when and how we will encounter him; the exact times and places of that encounter are not up to us. Someone who wants everything to be clear and sure presumes to control God’s transcendence. I (Fr. Rich) often say that Paulists have to stay in the seminary until they can say “I don’t know.” Do you ever struggle with the temptation to have an answer for every question? When have you experienced the surprises of God’ transcendence after ceding personal control? 50. Ultimately, the lack of a heartfelt and prayerful acknowledgment of our limitations prevents grace from working more effectively within us, for no room is left for bringing about the potential good that is part of a sincere and genuine journey of growth. Grace, precisely because it builds on nature, does not make us superhuman all at once. That kind of thinking would show too much confidence in our own abilities. Underneath our orthodoxy, our attitudes might not correspond to our talk about the need for grace, and in specific situations we can end up putting little trust in it. Unless we can acknowledge our concrete and limited situation, we will not be able to see the real and possible steps that the Lord demands of us at every moment, once we are attracted and empowered by his gift. Grace acts in history; ordinarily it takes hold of us and transforms us progressively. If we reject this historical and progressive reality, we can actually refuse and block grace, even as we extol it by our words. When have you struggled to trust in the grace you have received from God? How have you seen a grace build over the course of time in your life? 76. A person who sees things as they truly are and sympathizes with pain and sorrow is capable of touching life’s depths and finding authentic happiness. He or she is consoled, not by the world but by Jesus. Such persons are unafraid to share in the suffering of others; they do not flee from painful situations. They discover the meaning of life by coming to the aid of those who suffer, understanding their anguish and bringing relief. They sense that the other is flesh of our flesh, and are not afraid to draw near, even to touch their wounds. They feel compassion for others in such a way that all distance vanishes. In this way they can embrace Saint Paul’s exhortation: “Weep with those who weep” (Rom 12:15). Knowing how to mourn with others: that is holiness. When you are experiencing pain in your own life, how do you pray? Have you ever received a spiritual gift by accompanying someone else in their pain? Do you think that you know how to mourn with others? 116. Inner strength, as the work of grace, prevents us from becoming carried away by the violence that is so much a part of life today, because grace defuses vanity and makes possible meekness of heart. The saints do not waste energy complaining about the failings of others; they can hold their tongue before the faults of their brothers and sisters, and avoid the verbal violence that demeans and mistreats others. Saints hesitate to treat others harshly; they consider others better than themselves (cf. Phil 2:3). How do you nurture your inner strength, so not to succumb to the violence of our culture? When I (Fr. Rich) complain about other people’s failings, I find that it’s a symptom of not acknowledging a flaw or a shadow in myself. Do you have similar experiences? We live in a culture of self promotion. Are you comfortable acknowledging that other people may be better than yourself? When, in God’s presence, we examine our life’s journey, no areas can be off limits. In all aspects of life we can continue to grow and offer something greater to God, even in those areas we find most difficult. We need, though, to ask the Holy Spirit to liberate us and to expel the fear that makes us ban him from certain parts of our lives. God asks everything of us, yet he also gives everything to us. that my thoughts may all be holy. that my work, too, may be holy. that I may love only what is holy. that I may defend all that is holy. that I may always be holy. August 25: Novice Sign In, St. Joseph’s Seminary, Washington, D.C.
August 31: First Promises/Renewal of Promises/Final Promises, St. Joseph’s Seminary, Washington D.C.
October 16-18: Pastors/Superiors/Directors Meeting, Washington Retreat House, Washington D.C. The Associates World welcomes submissions of articles or information about upcoming events. These should be sent as Microsoft Word documents and attached to an email to dhpc18@gmail.com. Except for reporting on late-month events, we would appreciate receiving submissions by the 20th of the month before the publication date. Please contact editors Kathleen Lossau (klossau@austin.rr.com) or Denis Hurley (dhpc18@gmail.com) with questions or article proposals. Heavenly Father, you called your servant Isaac Thomas Hecker to preach the Gospel to the people of North America and through his teaching, to know the peace and the power of your indwelling Spirit. He walked in the footsteps of Saint Paul the Apostle, and like Paul spoke your Word with a zeal for souls and a burning love for all who came to him in need. Look upon us this day, with compassion and hope. Hear our prayer. We ask that through the intercession of Father Hecker your servant, you might grant us (state the request). We ask this in the name of Jesus Christ, Your Son, Our Lord, who lives and reigns with You and the Holy Spirit. One God, forever and ever. Amen. When you pray this prayer, and if you believe that you have received any favors through Hecker’s intercession, please contact the Office of the Cause for Canonization of Servant of God, Isaac Hecker at heckercause@paulist.org. 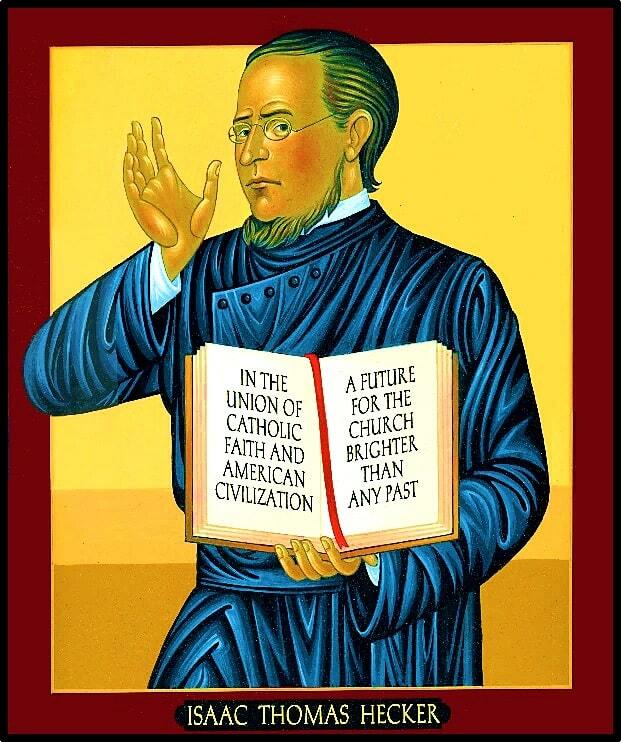 Visit the web site: isaachecker.org to learn more about his life and the cause for his canonization. I believe that I am drawn by the Holy Spirit to the spirituality and qualities of the Paulist Community. I have discerned both by prayer and study that God calls me to become associated with the Paulists. I promise that I will pray for the works of the Paulist Society, meet with others, who are also members of the Paulist Associates, for spiritual sharing and formation; and I seek to embody the apostolic qualities of the Paulists in my daily life. 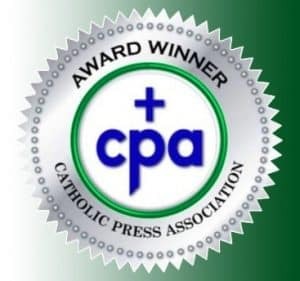 Attentive to the Holy Spirit and faithful to the example of St. Paul and the charism of Father Isaac Hecker, I commit myself for one year of membership in the Paulist Associates.